Russia will within the next two weeks send the S-300 air defense missile system to Syria, Defense Minister Sergei Shoigu said on Sept. 24. The delivery of the advanced missile defense system to Syria is “an adequate response” to Israel’s role in the downing of a Russian IL-20 last week, Shoigu was quoted as saying by Russian media. “The command posts of Syrian air defense forces and units will be equipped with automated control systems only supplied to the Russian armed forces. This will facilitate centralized control over all forces and resources of the Syrian air defense, monitor the situation in the air, and ensure operative issuance of orders. Most importantly, we will guarantee the identification of all Russian aircraft by the Syrian air defense systems,” TASS news quoted Shoigu as saying. Russia had initially backed off blaming Israel for the downing of the IL-20 by Syrian anti-aircraft fire but has shifted gears and now solely blames Israel for the incident in which 15 Russian service personnel were killed. 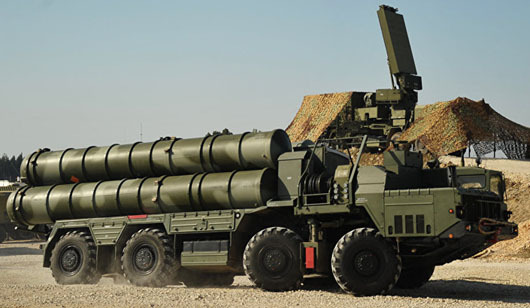 The S-300 will be a major upgrade to the Syrian air defenses. The long-range missile defense system can track objects such as aircraft and ballistic missiles over a range of 300 kilometers. Currently, Syrian air defenses are largely antiquated Soviet-era systems, with SA-2s, SA-5s, and SA-6s as well as the more sophisticated tactical surface-to-air missiles such as the SA-17s and SA-22 systems. Moscow has also supplied the short range Pantsir S-1 to the Assad regime.